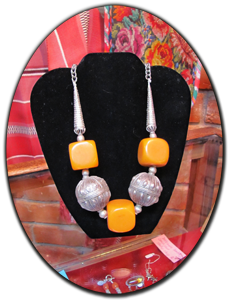 We offer select handmade silver and gemstone jewelry from Mexico, Guatemala, India, and the world. 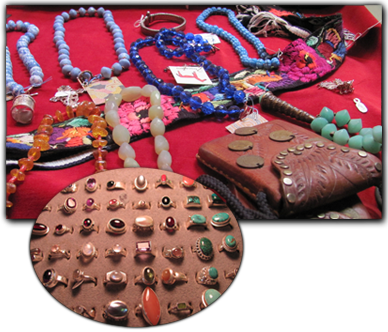 In our jewelry cases we proudly feature many Fair Trade companies--"Search Widens" sterling silver and gemstone jewelry is a fantastic array of syles and designs, Firefly Jewelry with fine Swarovski crystal and Czeck glass components is a visual treat ; the fine mosaic handwork and stunning color is truly unique. 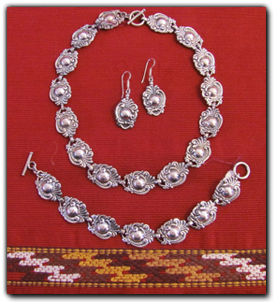 We also carry wedding chains and jade and serpentine jewelry from Guatemala plus Cherise Spellman's very special necklaces and earrings made of global treasures.